If you think you know how fan technology works, take a look at Antec's range of case fans and be prepared to think again. A million miles from the rickety desk fans that make an appearance on those two days a year when the UK gets warm enough to warrant them, Antec case fans are seriously cool pieces of kit. Case fans aren't going to win any prizes for being users' favourite components. They are there to serve a very important function and that's what matters when it comes to choosing which brand to trust. Antec case fans aren't just popular for their edgy appearance, which can really enhance the look of your PC's interior; they're popular because they're versatile, hardworking and easy to install. Depending on which model you choose and what you're using your computer for, Antec case fans give you the option to switch between two equally useful modes. One gives you silent operation and minimal distractions, so you can keep your head in the game or your mind on the task. The other lets you ramp up the cooling power to the max for those scenarios when your PC needs a burst of cool. 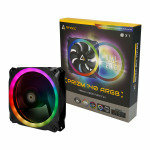 At Ebuyer, we stock a wide range of Antec case fans suitable for both business and personal use. Find your perfect case fan using the filters on the left of the screen. Don't forget that with Ebuyer you always get fast delivery and low prices.